Little Blue Ivy has yet to hit double digits, but she has already become something of a pop culture icon. As well as being almost as stylish as her music icon mother, the five-year-old has also lent her voice to album tracks from both parents. Oh, and she went on tour as a literal baby which is a pretty rock and roll way to kick start what will undoubtedly be an extremely cool life. And unlike many primary school age kids, pictures of Blue Ivy don’t just get a few likes on Facebook from her doting aunties and uncles. When her goddess mum – Beyoncé Knowles-Carter – shared a pic of her short and sophisticated new hairdo on her website, Blue Ivy completely stole the show even without her face being visible. 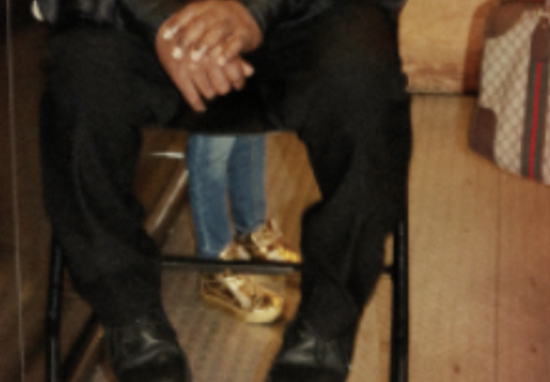 The internet completely erupted at the sight of the adorable little girl apparently hiding behind a security guard in an elevator, her tiny legs just visible in blue jeans and gold trainers. 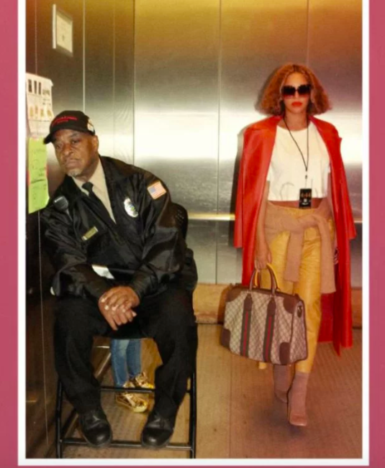 In the other side of the elevator, Queen Bey looked regal as ever in a 70s inspired get up; a long red coat thrown elegantly over her shoulders and huge movie star sunglasses. Fans of the famous family were in hysterics once the odd scene went viral. Another simply said: ‘Blue ivy hiding in the picture’, along with five crying laughing faces. Some fans have begun to suggest the picture was a result of Beyonce deliberately putting her daughter in the corner in order to get a clearer pic. One fan chuckled: ‘She told Blue to stand in the corner so she could take these pics lmaooo’. And this theory has stirred up a lot of emotions, with some people weighing in attack Beyonce’s parenting skills. One indignant person tweeted: ‘What a horrible, selfish mother. Only cares about vanity and looking good for social media. If she was proud of her daughter she would have shown her’. Another lamented: ‘This pic will have blue in therapy for years to come’. This pic will have blue in therapy for years to come. However – as is often the case with the Beyhive – there were plenty of fans ready and waiting to defend their Queen to the death. People are such haters. I can totally see me Myself telling my kid to hold on while I take a picture. Maybe she didn’t want her in the pic… can she live her f***** life! Myself telling my kid to hold on while I take a picture. Maybe she didn't want her in the pic… can she live her f***** life! damn y’all moms never told you to get out her pic? Blu ain’t gonna need no damn therapy! ?